In a state with 300 days of sunshine every year, outdoor living is a no brainer. You probably already spend a lot of time in your backyard or on your patio — why not take it to the next level with a custom outdoor kitchen from Artisan Outdoor Kitchens? You can find our team in a number of Front Range locations, from Boulder to Denver, and we can help you design the outdoor living spaces you’ve always dreamed of. There is a lot to decide when creating a custom kitchen, and the appliances you choose will likely be central to the overall design. So get started today, learn what kind of appliances and features you can include in your kitchen, and call Artisan Outdoor Kitchens! There are a few things to keep in mind when deciding on appliances, namely the fact that your appliances will be outdoors. You want them to be durable and long-lived, able to withstand whatever the Colorado weather may throw at them. That includes both high and low temperatures, wind, rain, snow, and often hail. Fortunately, you can find versions of almost every indoor kitchen appliance that are build for the outdoors. Here at Artisan Outdoor Kitchens, we recommend looking for stainless steel, because it’s beautiful, durable, and easy to clean. If you have other designs or materials in mind, let your design team know and we’ll work with you to find the perfect solution! 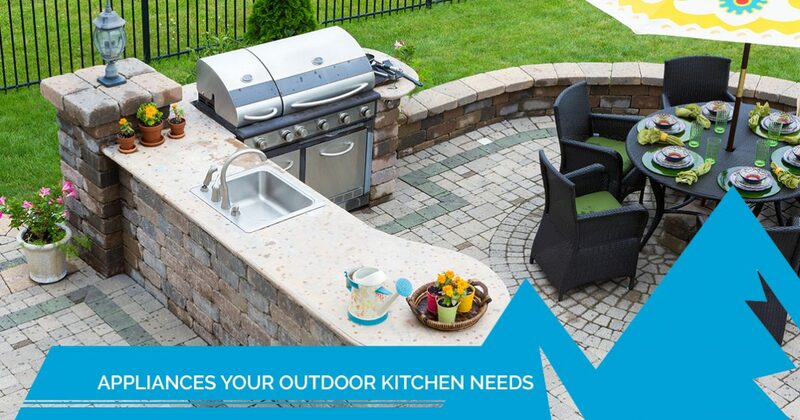 We pride ourselves on building outdoor living spaces that our customers love, and we’ll work hard to make sure we can accommodate whatever vision you have for your outdoor appliances. As we have discussed on our design page, one of the most important elements of an outdoor kitchen is an appliance to cook with. The most popular choice is, of course, the quintessential appliance for outdoor cooking: the grill. If you think that deciding on a grill is the end of your decision-making, however, then you haven’t truly embraced what it means to build a custom outdoor living space. You can choose exactly the kind of grill you want and where you want it within the layout of your outdoor kitchen. You may even want to consider adding a few additional burners for when you need to cook multiple dishes at once. The next appliance many people think of when building an outdoor kitchen is a fridge. Many designs incorporate an under-counter unit, where you can keep drinks, produce, or whatever else you might need at your next barbecue. A fridge built into your custom outdoor kitchen can keep things cold no matter how hot the summer days become and it keeps everything you need in easy reach. You will have to run electric lines outside, but many find it worthwhile, as it saves you from running in and out of the house to retrieve ingredients and fresh ice. One feature you might not have thought of? A built-in sink. Running water probably wasn’t foremost on your mind on the days where you just had a standalone grill on the porch, but if you want a full-service outdoor kitchen, you’ll want a sink. You can wash your hands, and you can wash produce mere inches from where you plan to serve it. Similar to installing a fridge, there are a few requirements you will have to accommodate. You will need to run plumbing lines from the house to your outdoor kitchen, but investing in the extra effort in the process of building your outdoor kitchen will pay off in convenience for years to come. 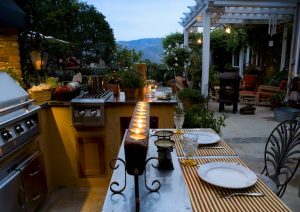 Ready to start designing your outdoor kitchen? Start talking to the experts! The team here at Artisan Outdoor Kitchen has decades of experiencing in bringing our clients’ dreams to life, and we can’t wait to help you build your outdoor living space. Whether you want a simple island kitchen with a grill, or you want a sprawling design that utilizes your patio and includes every appliance you enjoy inside, we’ll do our best to make it a reality. Check out our outdoor kitchen design page and our portfolio for more inspiration, and call today to schedule your personal consultation!